If I asked you to give me one adjective to describe B2B buying decisions, what would it be? As Ardath Albee, an influential B2B marketing strategist, pointed out in a recent article, although many tend to classify B2C purchasing decisions as emotional and B2B decisions as logical, that’s not the whole truth. This is because, as Albee underlines, B2B buyers are people too. 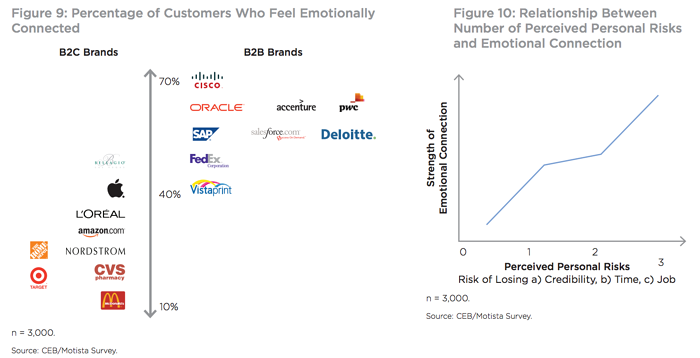 In “From Promotion to Emotion: Connecting B2B Customers to Brands,” the CEB Marketing Leadership Council in partnership with Google and Motista took a deep dive into this issue of how emotion influences B2B buying decisions. 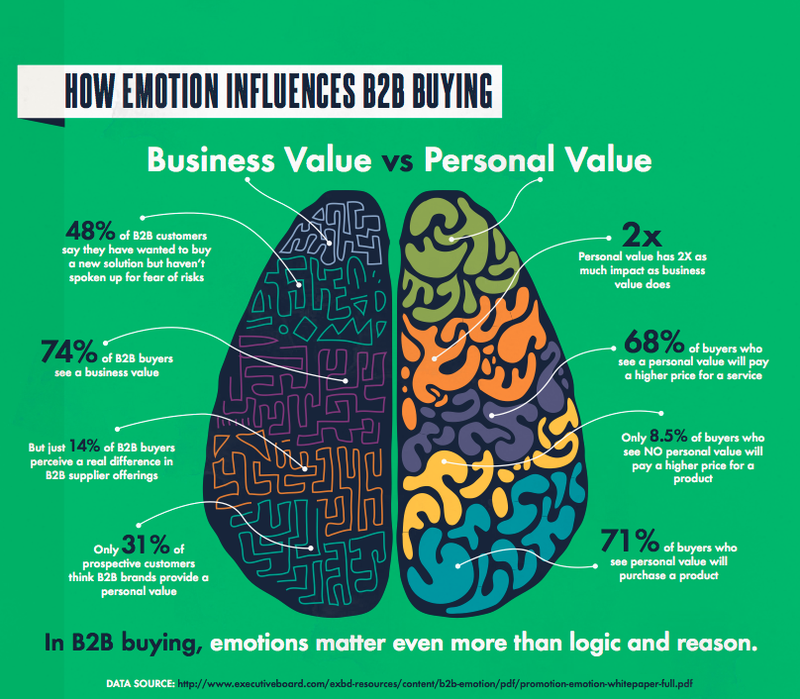 According to their findings, emotions matter even more than logic and reason in B2B buying. CEB used over 70 brand benefits on a broad range of 14 commercial outcomes to determine the roles personal and business value play. This means that B2B marketing should start repositioning their brand around personal value, not around practical reasons to buy. 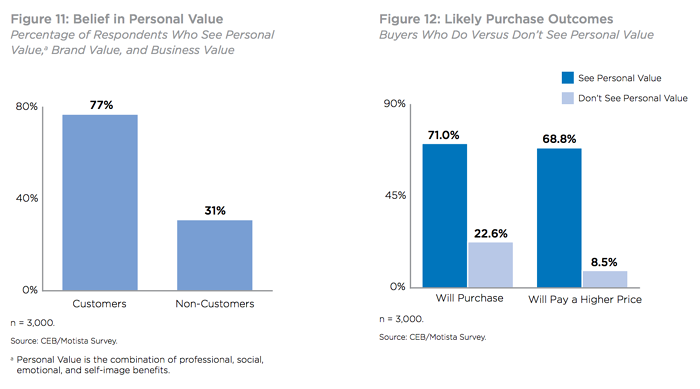 Digging deeper, CEB found why B2B purchasing decisions are so personal—even more so than B2C buying: B2B buyers feel personal risk when making buying decisions. B2B buyers are afraid they’ll waste time and effort if the decision ends poorly, that they’ll lose credibility if they recommend an unsuccessful product or service, and that they may even lose their jobs if they’re responsible for a failed purchase. B2B buyers are also more connected with the brands they choose to do business with. 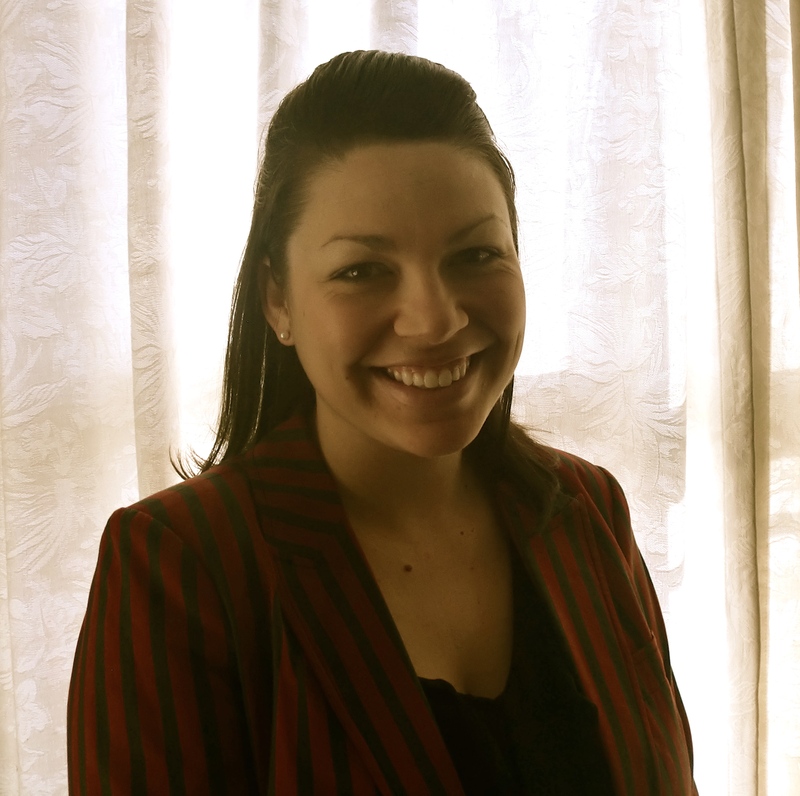 Meaning the personal value your business provides is critical to the overall business relationship. But if non-customers don’t know about this personal value, how will they ever become customers in the first place? If you’re not communicating the personal value non-customers can get by purchasing your product or service, you’re missing out on huge B2B marketing and sales opportunities. CEB found that “less than one-third of non-customers believe B2B brands will provide personal value.” And those that don’t see personal value are over three times less likely to purchase from that business. This means there is a HUGE opportunity for B2B marketers to demonstrate the personal value their product or service provides to increase overall sales. Start digging deep into what exactly your existing customers love about the personal benefits you provide to start onboarding new customers ASAP!